1.select all points that aren’t corners and set to auto-smooth. 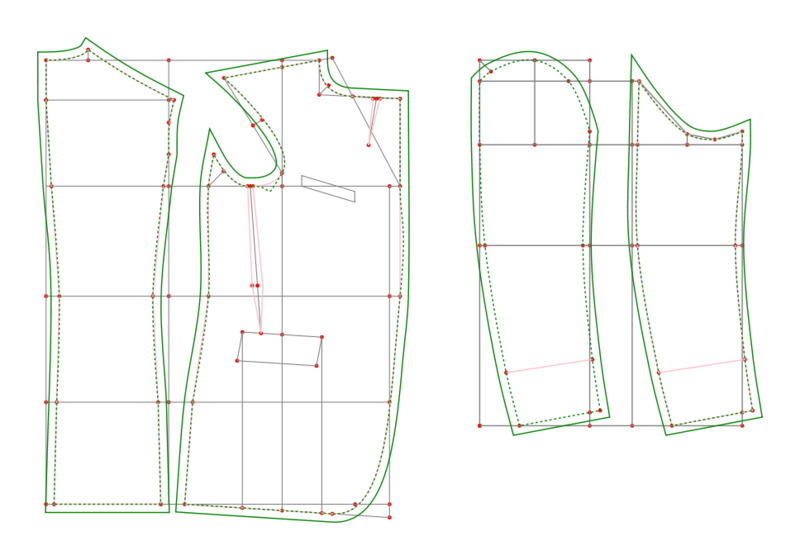 Set points at the waist line and elbows to symmetrical. 2. set Inkscape Preferences/Steps to 56.25px (5/8″) for Outset to equal a standard seam allowance. 7. click on Edit Object’s icon on upper toolbar, set stroke-style to be a dashed line. These steps will be incorporated into the extension soon, but I’ve got a deadline of this Friday to sew this up, and the pattern’s not completed yet. This entry was posted in Design, Inkscape, Process, Python, SVG and tagged extensions, inkscape, pattern making, python, svg. Bookmark the permalink. Try `python -h’ for more information. I’ve been out for Labor Day weekend. I’ll look into your error msg. What version of Python do you have installed, and which version of Inkscape? This is a project that is not ready for use, but I’m impressed that you are trying it out. You will have to take the file as a .pdf to a print shop to be printed on wide paper. Call the print shop first to get the document size, and change your Inkscape document size to that width. Rearrange the pattern pieces to fit on new doc size, save as a .pdf to a USB drive, then take it to the printshop. I’ve posted an updated version of the extensions on the wiki page. Instead of troubleshooting the old version, download the new version and see if it runs. It will add a different menu option in the Effects/Extensions menu – tmtp – and the jacket is labelled ‘Steampunk Jacket.’ There may have been a ‘cut and paste’ error with the p,revious as I’ve had inkscape support feedback that the old versions ran properly on versions .46, .47. and .48.